With the rising popularity of the Intel Atom in cheap laptops, a number of brands have cottoned on to this and have begun to offer Net-Top Computers. Low power desktop computers that satisfy the large market of users that require systems for web browsing, word processing, organisational needs and general media playback. Examples of these include the Asus EEE Box, which have flown off the shelves with their paltry £200 pricetags. As time moved on3, a number of motherboards began to trickle into the DIY retail market with Intel Atom CPU's embedded into them. So here's our question for the day. Do embedded Mini ITX solutions have the guts to satisfy todays average PC user? Today we'll be putting one of today's Atom ITX options to the test. 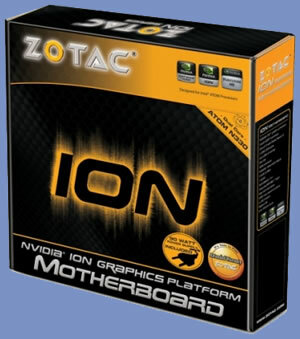 The Zotac ION 330 ITX Motherboard. Zotac is very much the new kid on the block compared to most other manufacturers such as Asus and Gigabyte. Initially, just an Add In Board (AIB) partner of nVidia based graphics cards, they have diversified and begun to add motherboards to their portfolio. Zotac's motherboard range mainly consists of entry level and media centre based solutions but they offer a wide range for both Intel and AMD users in Mini ITX and Micro ATX form factor. Certain motherboards in particular such as the GeForce 9300-ITX motherboard, a Mini ITX LGA775 motherboard featuring a full size PCI-Express 16x slot was very well received by reviewers and end users alike so it'd be interesting to see what we make of this comparably elaborate looking product. Though some of you might be wondering why we're reviewing something that's in essence an entry level solution? There must be something special about it surely? Well yes, there is. This is the first Intel Atom Mini ITX motherboard to hit the market with the much more capable nForce 7 MCP, featuring Direct X 10 GeForce 9400M graphics. It doesn't end there as Zotac have managed to fit 3 x SATA ports, integrated WiFi by Mini PCI-E, full size 240pin DDR2 DIMMs, 6 x USB ports, e-SATA, three different video inputs (DVI, HDMI and D-Sub) and even an embedded power supply solution with a passive 90W transformer brick. What's more is that the motherboard is shipped with the dual core version of the Intel Atom 1.60GHz CPU. Aluminium Heatsink and 80mm Fan.